At least in Seattle when you become accustomed to 65 being a gorgeous day. It has been raging here in the mid 80’s and its time to make a remedy to compliment the sun. Whats better at taking the edge out of the blistering heat than a cold slushie? Now most of the slushies that I have been accustomed to in my life consist of frozen lemonades and soccer tournaments, or your classic coke slushie from 7-11. 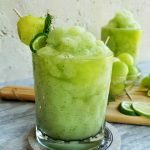 I wanted to make a summertime flavored slushie that was seasonal, simple, and oh so refreshing. My mind immediately went to lime and mint which scream freshness, which then got me thinking of Moscow mules. Now I am all for a great alcoholic slush, but this time around I wanted to go non alcoholic, so everyone can enjoy. I wanted to focus on the flavor of the mule ( ginger beer) without the burn (vodka). To make this drink even more summery I decided to use frozen honeydew melon instead of ice cubes. They give this frozen treat a wonderful sweetness, and gorgeous light green color. Now choosing the right gingerbeer, in my opinion, was the most important part. You want a brand that has a VERY STRONG fresh ginger flavor, nothing that is masked by too many other aromatics. I found The Ginger People unfiltered Bottoms Up Ginger Beer to be the most appealing. Unlike other ginger beers this brand uses unfiltered ginger, no juice, extracts, or oils, just delicious ginger. With just 4 simple ingredients the ginger flavor is front and center, spicy, and aromatic. Which when mixed with sweet melon makes a fresh frozen treat that’s worth seconds, even thirds! This is a great treat for a summer BBQ, pool party, or when you just need a cool break from the sun. Enjoy immediately with a straw or a spoon! 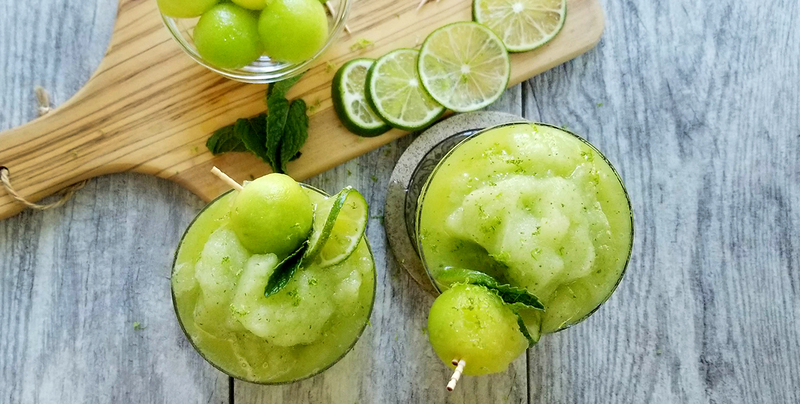 Ultra refreshing ginger beer slushie blended with bright lime, fresh mint, and frozen sweet honeydew! A great non alcoholic option for those who love the taste of Moscow mules and summer! 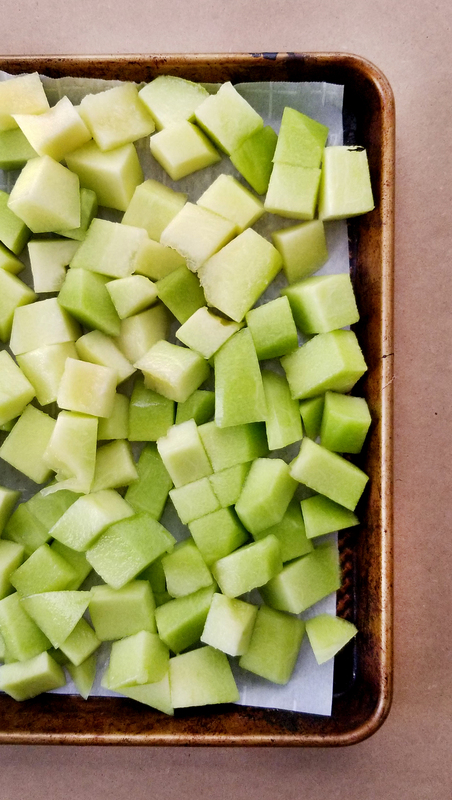 Remove skin and seeds from honeydew. Chop into chunks and spread out onto a parchment lined baking sheet or plate. Place in the freeze for at least 2 hours. Place all of the ingredients in a blender. Cover and blend on low at first, then increase the speed to get an even consistent blend. Pour into glasses and top with fresh lime zest.